It is a rare opportunity to meet Austrian makers of premium products and divulge their secrets, so when another Austrian company Master Yachting took over as a brand dealer for the Adriatic, we used the opportunity to visit the Frauscher shipyard, to feature the Austrian builder in our magazine and to suss out what made Master Yachting add Frauscher to their already interesting but mostly charter oriented portfolio. Frauscher owe their success to a sure-to-succeed combination: high quality motor yachts from 7 to 14 meters, with impressive performances and attractive design. The yard is located in an unexpected and almost exaggeratedly picturesque setting: in the mountains of Upper Austria, near the town of Gmunden at the Alpine lake of Traunsee. Founded in Vienna in 1927, Frauscher moved to Gmunden in 1945, where their (always) state-of-the-art production halls stand to this day. The old yard is no more, but a small marina still owned by the Frauscher family serves as a company ‘museum’ and a vivid summer base for over 200 boats where you see almost all their models through decades, including sailing yachts the yard no longer builds. We went straight to the new facilities: we really wanted to see that state-of-the-art complex. The building process is unusual to say the least – we have never seen small boats built like that. Each boat is assigned to a team of people who builds it from start until completion, at a dedicated building island – there is no assembly line, there is no moving the boat along the hall from station to station. The team which also includes wood specialists, does everything to complete their boat. Furthermore, if you look at the fact that both petrol, diesel and electrical engines are installed in new boats, the skill of the workforce has even more ‘weight’. This interesting method definitely has definitely many advantages in addition to the most obvious one – extreme quality control – which also requires the yard to have a large number of highly skilled workers. Which they do and they are very proud of it. The shipbuilder is also very proud of their ability to customize their motor yachts to the tastes of all clients, and even though we knew that going in, we were still pleasantly surprised by the sheer number of completely different boats in various stages of completion scattered throughout the complex. The yard insists on testing every finished boat in their own little test pool, so when the boat is ready to leave the yard and to be delivered to the owner, it is definitely ready: once again, the meticulous and hard-working Austrian spirit shines through, as expected. The unexpected part? Many boat parts are made locally and customized, allowing for such precise tuning. 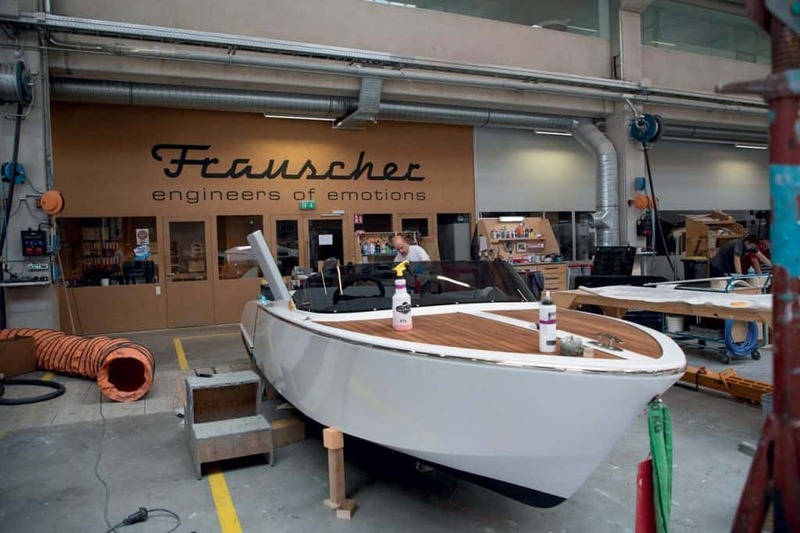 The local suppliers – like the makers of stainless steel elements we admired on semi-finished boats in the production hall – are very skilled in creating parts completely in step with Frauscher’s own style, so they, too, are in part responsible for the overall impressive finished product. 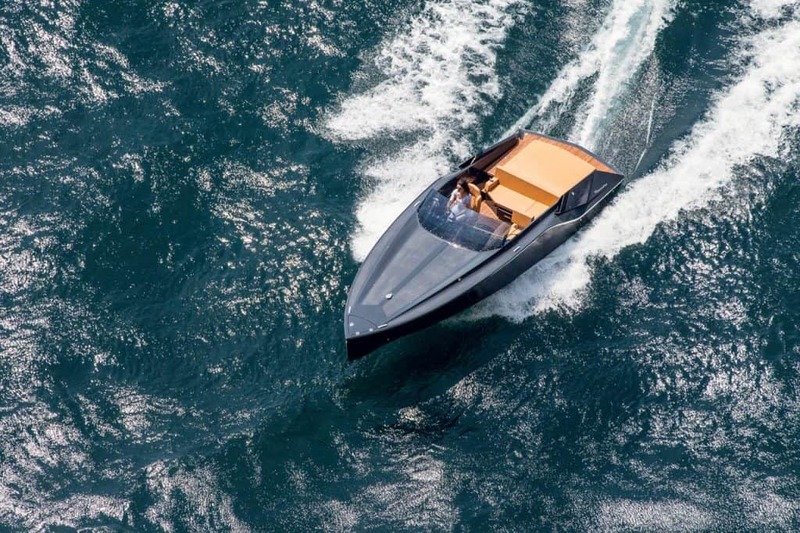 The relatively simple building process is fail-proof and fast, and an unexpected means of guaranteeing quality – which is why Frauscher is proudly galloping along much larger makers of luxury motor boats without missing a step. 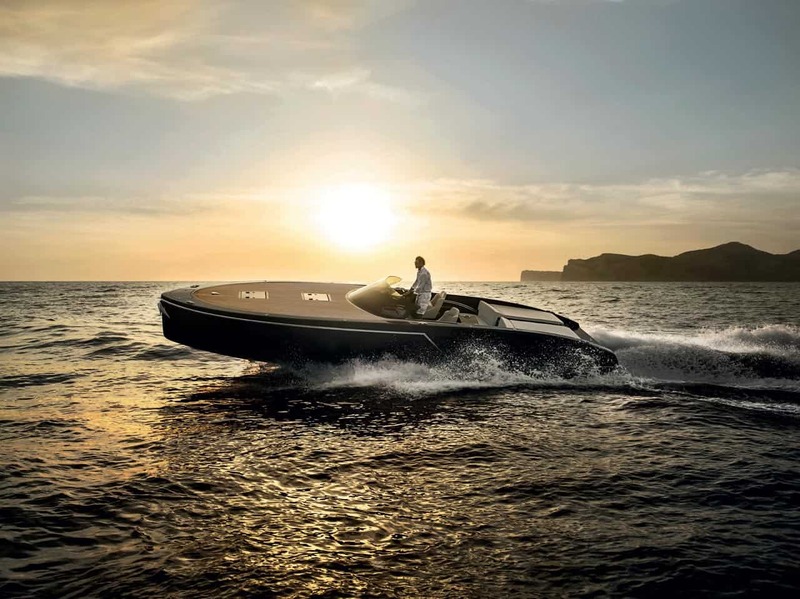 The most popular among the 75 models presently built by Frauscher is the 1017 GT, with over twenty units sold a year. All Frauscher models share the same appeal and even those who aren’t interest in yachts and those who haven’t been to Gmunden have definitely seen a Frauscher or two in their life – most probably on the pages of a glossy fashion or design magazine, as Frauschers are often hired as extras on fashion or luxury design product shoots and ad campaigns. If you want to see Frauschers in their natural habitat, your best choice is the Balearic marina Port Adriano, where Frauscher have set up their Mediterranean base. Just contact Master Yachting to announce your arrival and set up a date, and then feast your eyes on both Frauschers and the Balearic Islands. Austrian Master Yachting is the licensed Frauscher dealer for the Adriatic, well aware of the appeal of Frauscher boats and they revealed a little secret. Nautica Feltrinelli is an owner of ten such boats available for luxury day charter at Lago di Garda center working with a high profitability. Day charter is gaining attraction in Croatia and we have no doubt Frauschers will be very popular in that segment of the market. The first model delivered in Croatia is 1017 GT which went to company Adriatic Sailing in marina Kaštela and will be used as a luxury charter and demo boat as well. But the most pleasant option for all who can afford it we would still advise to simply go to Gmunden and buy a private one.